THE chef Anthony Bourdain has travelled the world in search of the perfect meal, which he defines as mind-blowingly delicious food garnished with a dash of danger and novelty. To this end, he ate a roasted lamb testicle with the Tuareg tribesmen in Morocco and deemed it sensational. "It was crispy and veiny but tender, even fluffy," he says. In his new book, A Cook's Tour, Bourdain wonders if he could call it pave d'agneau maroc and serve it to his unknowing Manhattan customers. It's not yet on the menu at Les Halles, the Park Avenue brasserie where he is executive chef but, if I were a regular there, I'd keep my eyes and onions peeled. Just in case. Elsewhere, Bourdain had confit of pigs' ears, snouts and feet in Portugal, drank moonshine from a plastic cola bottle and dined on clay-roasted duck and bitter melons in Vietnam. In Japan, he guzzled his way through a fugu, the blowfish that can fatally poison if the nerve toxins in its liver and guts are ingested. Bourdain had sashimi of fugu, nabe of fugu then batter-fried fugu and lived to tell the tale. "Delicious, but hardly the white-knuckle experience I had hoped for," he says, a touch wistfully. Certainly not as thrilling as the still-beating cobra heart, which he washed down with cobra blood and cobra bile in Saigon. "It tasted like a very angry oyster," he says. And you don't want to know about the soft-boiled duck embryo, the crispy-fried tree grubs or the marinated calves' womb which all tumbled down his gullet, lickety-split, in his pursuit of the world's greatest extreme cuisine experiences. So already, we are getting a picture of what Mr Anthony "call me Tony" Bourdain is all about. He's got nerves and a stomach of steel. His taste buds are as tough as cricket balls. He favours no-nonsense dining and there is almost nothing he won't eat. Almost nothing. At his insistence, we are in a branch of Angus Steakhouses on Shaftesbury Avenue, central London, potentially on the threshold of one of the most perilous eating assignments in the western world. Why are we here? We are here because Bourdain, like many who pass through London, has become fascinated by the 30-odd branches of the Angus and Aberdeen Steakhouses, which are strung across the capital like a stump-toothed smile. "High rent locations, a restaurant chain with few visible customers open year after year? I'd say I was more than fascinated. I have become morbidly obsessed," he says. The chain is owned by secretive Turkish businessman Ali Salih - he reputedly tried to sell some branches off last year - and has become a culinary urban myth: why is there scarcely anyone - bar a few confused tourists - inside them? To be fair, there are eight other customers here on the night we perch inside one of the famous scarlet, balding nylon booths. My fearless, entrail-chomping dinner date has suddenly decided that, hey, he's not hungry after all. How about some Kiev Filled Turkey Bites (five pieces) as a starter? "No. I think I'll pass on that." What about a Californian cheeseburger, a delicacy served with whole mushroom, garlic sauce, fresh tomatoes, melted cheese and - barf - raw onion? "Now, I don't think much of California, but I don't know any Californians who would eat that," says Bourdain. "The duck! I dread the duck. God knows what dark corner of Hell that was dragged out of. I'm just having a sirloin." Should we even consider pudding? "No way!" he cries. "But I need a beer." As we wait for our food to arrive, Bourdain picks up the plastic, wipe-clean menu and scans the list with a practised eye. "Uh-huh," he says, nodding. "Hmmm hmmm. Just as I expected. The menus are bigger than they have to be, a sure sign that a lot is straight from the freezer. It's a steakhouse with more seafood than it should have. And there. . ."
Clang! Just then, a member of the waiting staff drops some crockery on the floor. "And there," repeats Bourdain, without missing a beat, "is a fork that is going straight back into service." Our food arrives - steak with chips for him, duck for me. His comes as a greying slab of meat which looks like something you might nail on to a boot to aid your progress up a mountainside. "Very cheap steak," he says. "It's not good but it's not horrible. In some ways, it is exactly what it should be, although I have to say that the cobra stew I ate was nicer." His elbow swivels in the air as he attempts to saw through the unyielding meat. "Here's a good tip for a steakhouse - invest in some sharp steak knives," he says, regarding my duck with a beady eye. "Be afraid. Be very afraid," he says, stabbing his index finger into the pool of orange sauce for a taste. He wrinkles his face at the onslaught of chemicals, for the citrus gloop tastes like a rendered-down ice lolly. There is a pale lip of fat and no caramelisation on the duck breast, suggesting that it has been cooked in the microwave rather than being seared and roasted. Big, tough Bourdain of bile 'n' blood fame refuses to sample it. "I know what it is going to taste like," he insists. A professional chef of 28 years' standing, Bourdain became an overnight literary star in 2000 with Kitchen Confidential, a swashbuckling exposé of some of the more nefarious catering practices with the author right in the middle of the action, swinging his knife like a cutlass and urging on his kitchen crew of "talented throat slitters, fire starters, mercenaries and hooligans". Bourdain is clearly still in love with this piratical image he has of himself; today he is wearing a leather jacket and a T-shirt, his long legs encased in demin jeans. A gold, hoop is in his left ear and he sports a thumb ring on his right hand. Earlier, when I had gone to meet him at his Soho hotel, he was standing outside in the rain, smoking a cigarette, looking slightly menacing in the shadows. Then we strode off down the street, his cowboy boots slapping loudly on the wet pavements, puffs of sharply extruded smoke dancing in his wake. He's a little bit country, a big bit rock 'n' roll and he is not here to poke fun at British cuisine. "This place is the exception, not the norm," he says, tapping the Formica table. "Today, chefs from all over the world come to London to look, taste and learn. It is an amazing city for restaurants." It is not that he is scared of the darker corners of English cooking, for Fergus Henderson's St John's is his favourite London restaurant. In what Henderson has dubbed "nose to tail" eating, the stripped-down Clerkenwell eaterie sells all the offally bits you wish you'd never heard of, plus chitterlings, rolled spleen, marrow you have to dig out of the roasted bones yourself and - when I was there last weekend - a magnificent dish of roast kid breast. Everywhere he goes, Bourdain has a personal and professional interest in the food he is served and on this trip - with the exception of tonight's sad offerings - he admits that he has been dining like a king: entrecote steak with a compound garlic butter at the fashionable Bush Bar & Grill in west London, fresh anchovies at a "fabulous" lunch at Richard Corrigan's Lindsay House. Now, he has also satisfied his curiosity about London's sad and lonely steakhouse chain. Will he ever go back? "Never," he says. His boots ring out on the pavements once more as he strides away into the night. 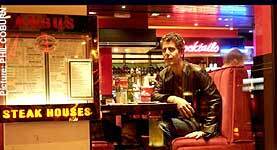 'A Cook's Tour' by Anthony Bourdain (Bloomsbury, £16.99) this interview took place in 2001.